Sue Cox Diary of a recovered catholic, happy Atheist,Humanist - with just a tiny touch of ZEN! : Guilt Guilt Guilt! Listening to the radio this morning, I stumbled upon people talking about the issues of "sin" , what is it? how do we avoid it,? what constitutes a "sin"? Needless to say it was unadulterated sanctimonious claptrap, but it did get me thinking about my own upbringing and how practically everything apart from breathing was considered "sinful"
I was obsessed with being good! Hardly surprising really when you consider, as I have recounted many times, how I was told aged 5 to kneel and pray for a cousin of mine to die! His "sin" was to be intent on marrying a divorcee, and his Mother(my Aunt) was told by her priest that he would be better off dead than living in "sin" So we were all told to kneel and pray for a "happy death" for Ted. So all of my growing up years I was quite convinced that people would be praying for me to die every time I committed a "sin" (which seemed almost all of the time) It was really quite terrifying, which of course was the object of the exercise! To keep us terrified and in constant fear of hell fire and damnation.The idea that I was born a "sinner" was drummed in at every turn! 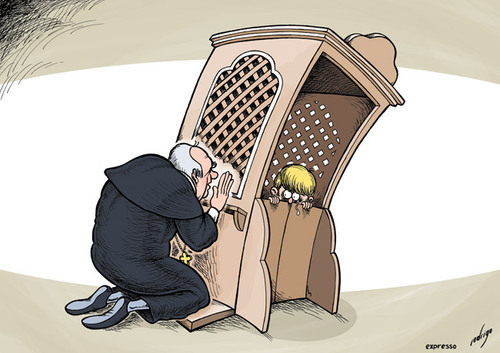 The whole concept of "sin" is cruel and appalling and to feed this kind of fear in tiny children is REAL child abuse. 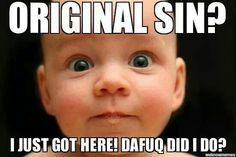 I was given the image that each time I "sinned" it was like going up to the baby Jesus in his pram and SLAPPING his face really hard (this was accompanied by loud slapping and gestures!) And not only that, but even when his beautiful brown eyes were full of tears, I went and SLAPPED him again!! GUILT GUILT GUILT poured on in bucket-loads! I always felt lower than a snake's belly in the grass! The "get out of hell" clause was of course the confessional! That horrifying of places where the priest hiding behind a grill listens to your every sin of "thought word and deed" and then gives you a penance as he absolves you from those terrible sins! The implications for that are massive! Not only is he listening to everyone's innermost thoughts and fears, he is identifying who you are! Who comes from a family that doesn't protect them or who are so priest obsessed that the child will always be sacrificial. He knows who has not paid their taxes, missed going to mass, committed adultery, is maybe into the same fetishes as he is, and as he listens to children's accounts early sexual "fumblings" who knows what he is doing on the other side of that grill! It is a grooming box of sickening power abuse possibilities. Then there are "sins of omission" which are the ones you have NOT told the man behind the grill! I remember having discussions with other kids, about wether something they were doing was a "sin" or not! If it wasn't on the "list" it must be ok, no matter how unpleasant it actually was. The ludicrous thing about all of this is of course it is actively stifling the human being's natural desires to be "good" that inherent quality of human beings that are benevolent and decent. The catholic church is the antithesis of good! We are a benevolent species, despite what we hear daily in the media, we naturally want to do right by each other, we are mostly and naturally altruistic. We do not need these power hungry narcissists with their lists to tell us what the "right thing" is! We already know. So stick your list of "sins"! We are human beings and quite capable of being "Good without god!" Very powerful statement that resonated with me: "The ludicrous thing about all of this is of course it is actively stifling the human being's natural desires to be "good" that inherent quality of human beings that are benevolent and decent"